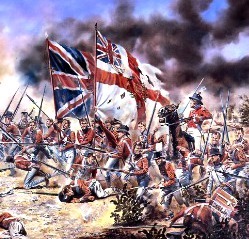 A History of the 74th Regiment's Uniform 1787 to 1880. 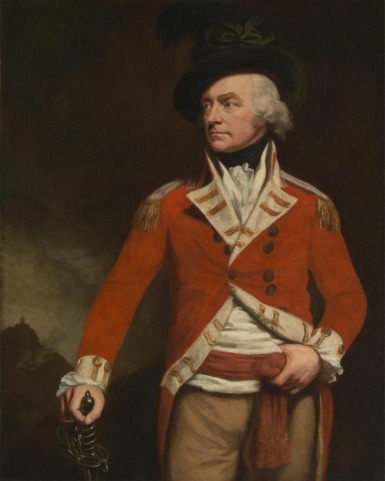 Regimental uniform in 1803 by David Rowlands. 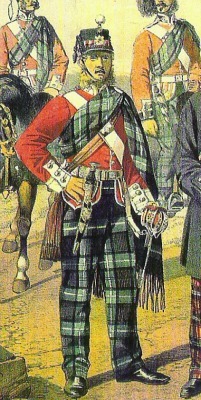 Regimental uniform early in the 19th century. 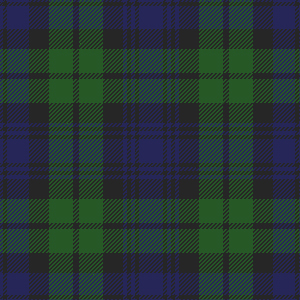 The regiment embarked at Madras (India) in September 1805, a mere skeleton so far as numbers were concerned, landed at Portsmouth in February 1806, and proceeded to Scotland to recruit, having resumed the kilt, which had been laid aside in India. 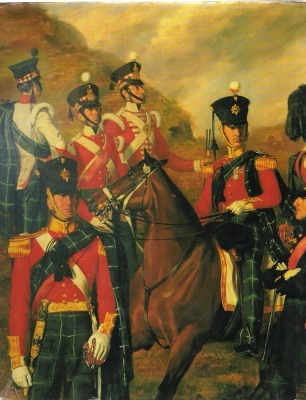 The regiment was stationed in Scotland (Dumbarton Castle, Glasgow, and Fort-George), till January 1809. 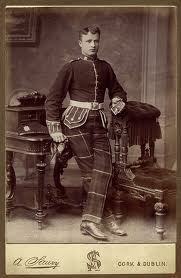 The above print was done in the 1840's and could be this uniform. 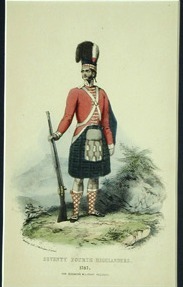 The regiment left Scotland for Ireland in January 1809, and in May of that year it was ordered that the Highland dress of the regiment should be discontinued, and its uniform assimilated to that of English regiments of the line; it however retained the designation Highland until the year 1816, This print of the regimental uniform of the 71st Highlanders Ca 1812, by Keith Rocco, shows a uniform that would also worn by the 74th at this time. It is unclear if bonnets blocked like here seen were worn by the 74th between the years 1808-1816. 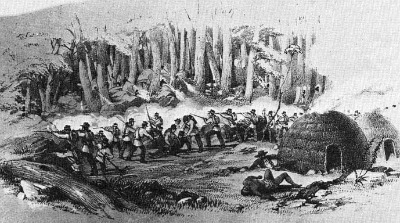 After 1816 the 74th Regiment's caps would not have a diced band. 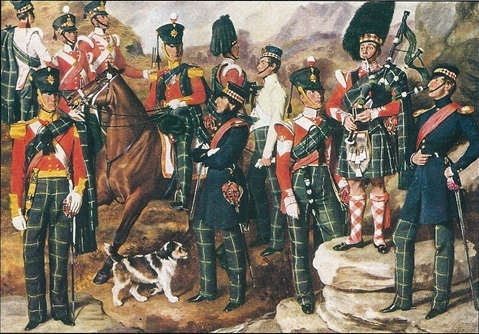 Regimental uniform in 1846 by David Cunliffe. 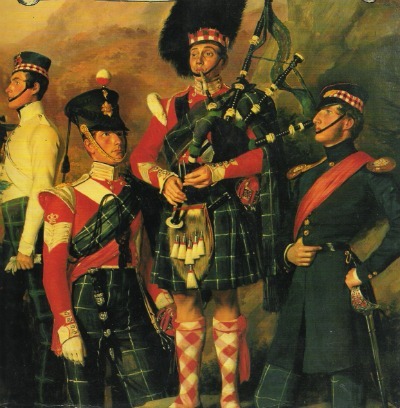 In 1846 the 74th was permitted to resume the national garb, and recruit only in Scotland. 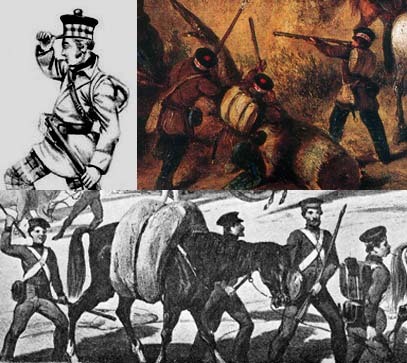 Regimental uniform in the Kaffir War, South Africa 1851:Top two images are of the 74th bottom image is of another British Regiment. 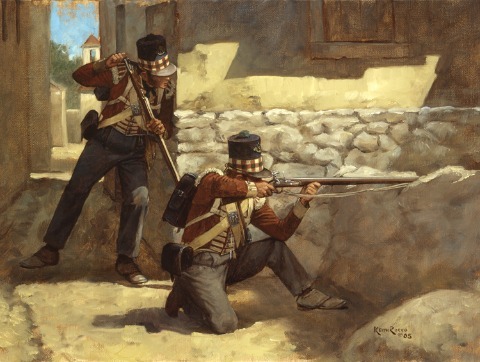 From the regimental history: "Colonel Fordyce saw that the ordinary equipment of the British soldier was in no way suited to African campaigning, and while at Fort Hare he made a complete change in the appearance of the regiment. The dress bonnets, scarlet tunics, black pouches, and pipe-clayed cross belts, were put away in the quartermaster's stores. Common brown leather pouches and belts were issued, while an admirable substitute for the tunic was found in the stout canvas frocks of which a couple are served out to each soldier proceeding on a long sea voyage. 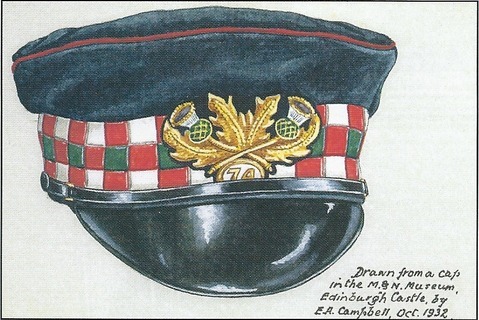 These had been carefully preserved when the regiment landed, and now, with the aid of copperas and the bark of the mimosa bush, were dyed a deep olive brown colour, which corresponded admirably with that of the bush, and was the least conspicuous dress of any regiment in the field, not excepting the Rifle Brigade and 60th, both of which corps had a battalion engaged. The cuffs and shoulders were strapped with leather, and this rough-looking but most serviceable tunic was worn by both officers and men as long as they were actively employed in the field. The forage cap, with a leather peak, completed the costume." 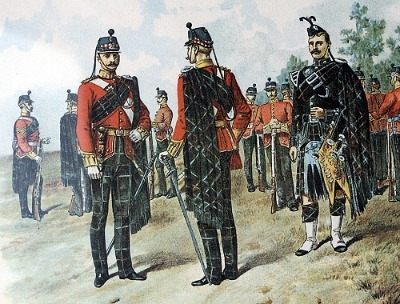 A new regiment was formed as part of the Childers reforms on 1 July 1881 by the amalgamation of the 71st (Highland) Light Infantry and the 74th (Highland) Regiment of Foot as the city regiment of Glasgow to be known as the Highland Light Infantry.